Boiler problems can be a threat to your safety and can lead to inefficiencies in energy consumption and the operation of the boiler. In seasons such as winter your boiler is in constant use and this can lead to wear and tear. Some of the boiler issues are easy to identify while others require professional inspection. The best time to identify the issue is during servicing. Only a certified and experienced engineer can identify the boiler issues and provide a reliable solution. Contact Eco Efficient Dundee; our engineers are qualified, reliable, experienced and Gas Safe Registered. The main aim of boiler servicing is to extend the life of the boiler and to prevent potential boiler problems from affecting the boiler. Every homeowner should schedule servicing once every year. This does not mean that you cannot service your boiler any other time; if you notice any sign of boiler inefficiency, contact Eco Efficient Dundee for random servicing. We will be right at your premises within minutes after your call. We have mobile service vans all over Dundee ready to answer you when you call. They are packed with up-to-date parts in case we need to replace any part. For efficient services, we have invested in state of the art equipment to help us identify and arrest a problem while it is still in its initial stages. 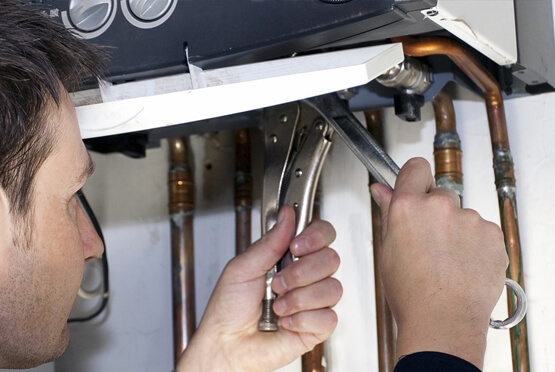 Our engineers have also gained a lot of experience in boiler servicing over the last decade. Eco Efficient Dundee engineers are authorised to repair different makes and models of boilers in the UK. With such standard of service you can be sure your home is safe, comfortable and warm all year round. Timely boiler repairs save you money. In most cases, the boiler problems identified during servicing are normally in their initial stages. The repair costs for such problems are low and at times negligible. However, if you ignore the issues, they can become more complicated and require large sums of money to repair. In some cases, you might need to replace the boiler due to delayed repairs. Why wait until it is too late to repair your boiler? Reach out to Eco Efficient Dundee today! We have a 2 to 5 years warranty on labour and 5 to 10 years warranty on boiler parts. During our servicing, we inspect the valves, seals, controllers, gas and boiler leaks, and pipes for faults. Our solutions are pocket friendly and guaranteed to give you value for money. Do not be shy to call us; you will not regret. When you talk to anyone in Ninewells, Longforgan, Monikie, Monifieth, and Tealing, they will confirm that Eco Efficient Dundee is the most reliable boiler servicing company. Our boiler services are available 24 hours a day. You can rely on us because when you need us, our engineers will bail you out! Call us or visit our offices today for unforgettable servicing in Dundee.